The Mixvent Series is a very compact design of mixed-flow fans that is part of a very flexible system designed specifically for use in homes, hotels and apartments etc., as well as for hot and cold air transfer from one room to another. The casings of the 1300/250 and 2000/315 models are of epoxy coated steel; other sizes are of reinforced injection moulded plastic. All units are provided with an integral mounting foot. Impellers are of injection moulded plastic/steel and of mixed-flow design. Type – 2-speed. Models 160-350 are shaded pole; 500 and above are squirrel cage induction motor. Electricity supply – 220-240V, single-phase, 50Hz. Bearings – sleeve up to size 350/125 and ball for all other models. Speed-controllable using VA type speed controller in high speed only. By fuse to size 350/125 and auto-reset for the remainder. The fans can be removed without disturbing the connecting ductwork via specially designed support brackets and a 2-speed switch can be supplied that suits all models. In addition to being used as single-stage fans the Mixvent range can be arranged in parallel, in series or in both parallel and series. Such flexibility enables higher air flow and pressure demands to be met. Refer to AMS representative for details. 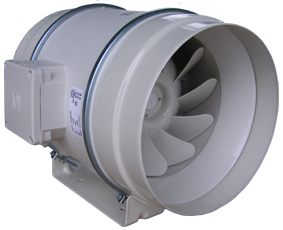 The In-line fans shall be of the Mixvent Series as supplied by AMS. Impellers shall be of mixed flow design and driven by 2-speed single-phase motors with integral thermal protection.